“Information meets matter.” These three simple words describe a critical and complex cross-industry trend, and a key research theme at Lux Research in 2015. At its heart is the intensifying intersection between the world of data, designs, and ideas, and the physical world of materials, machines, and living things. To us, the phrase includes big ideas, like the Internet of Things (IoT) and Big Data, but it’s more than that. It’s increasingly ubiquitous technologies that turn physical phenomena into information, and nearly as easily turn that information back into material things. Between the Internet of things (like wearables and vehicles) and smart spaces (like homes, offices, factories, and infrastructure), the number of sensors in our lives – on wrists, cars, thermostats, cubesats, and everything else – is soaring (witness the “Trillion Sensor Summit” series). Tiny, cheap MEMS accelerometers enabled Fitbit’s fitness trackers and DIJ’s quadcopters; GPS chips entered watches, phones, and cameras. While the number of sensors grows, the number of kinds of sensors is growing too: in the next five years, depth cameras (like Microsoft’s Kinect, Intel’s RealSense, and Apple’s PrimeSense) will become pervasive, giving all kinds of objects a 3D awareness of where they are in the world, and the ability to recognize human gestures and emotions. Tactile (SynTouch, TeslaTouch), neural (NeuroSky, Emotiv), and biochemical sensors will integrate our bodies with the network and the combination of audio and artificial intelligence in devices like Amazon’s Echo, Imperial College London spinout Eddy.io, and Russian startup Cubic (“Let me become your personal assistant, home automation brain, consultant, and private coach”) complete the digitization of human senses. The output of these sensors is gargantuan and growing: GE recently said that it gathers its 50 million data points from 10 million sensors on 21,500 locomotives, 23,000 wind turbines, 3,900 gas turbines and 20,700 pieces of oil and gas equipment worth $1 trillion every day. As the volume, velocity and variety of our daily data output increases, new information technologies in big data, predictive analytics, and artificial intelligence are needed to manage and make sense of it all. The Industrial Internet Consortium (IIC) is creating a language to let legacy factory equipment speak with newer machines, while Synthase is developing an open-source language for bioprogramming. Information-intensive industries like media, banking, retail, and travel are already applying them, but they are now entering material-centric industries like oil and gas (intelligent oilfields), food (personalized nutrition), and farming (precision agriculture). To learn more about these events contact carole.jacques@luxresearchinc.com. 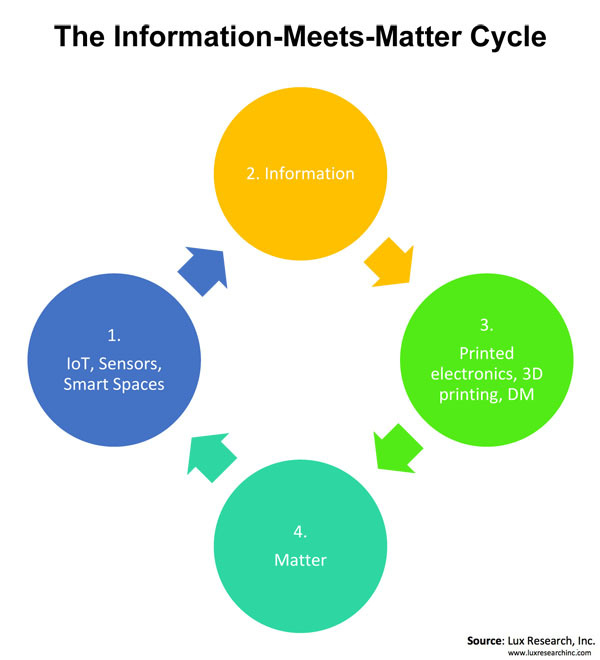 Sensors turn matter into information, but today, information flows back into matter with increasing ease. For example, Autodesk offers its high-powered engineering software in simpler, free versions that even schoolchildren can use for desktop 3D printing. At the far extreme from this simplicity, digital construction (3D printing buildings) has gone from science fiction to a top topic in the construction industry. In between, there are dozens of other manufacturing techniques and applications like printed electronics, gene synthesis, and many more that are becoming more economical and more accessible to college students and startups. The collective impact of these production technologies is shifting the economics of manufacturing to favor smaller-scale, distributed microfactories. Local Motors recently printed a car onstage at a conference. Biohackers have designed and created plants that glow and change colors. Neurotech startup Thync proposes to not just measure your mood, but to change it. Additionally, Otherlab is developing mathematical models and manufacturing methods for origami-like structures that are “re-programmable, repurposable, and blend the boundaries between materials science, computer science, biology, and mathematics.” Fiber-optic fabrics, soft robotics, intelligent fluids, and many other novel materials are now possible, and capable, of providing new properties and functions, including the ability to sense changes in the environment and convert those measurements into information, closing the Information Meets Matter cycle and starting it again. The impact of information meeting matter is already widespread and profound, and Lux Research is expanding our research on the trend. As with any new field, there are urgent actions and minefields to avoid, good business cases and money pits, and unexpected winners and devastated also-rans. To find them first, throughout this year we’ll look specifically at new sensor technologies and how they are being applied to products and processes and will be researching tools and strategies for managing the information they create in an industry-by-industry series on Big Data. Interested in discussing Lux Research's work in ImM? Contact Mark at mark.bunger@luxresearchinc.com or Kevin at kevin.see@luxresearchinc.com.